Our next major historical title, Total War: THREE KINGDOMS, features two modes: Classic Mode (predominantly based on the historical text Records of the Three Kingdoms) and Romance of the Three Kingdoms Mode (inspired by the 14th century historical epic of the same name). Classic Mode is everything you’ve come to expect from eighteen years of historical Total War: a commitment to historical authenticity, grand-scale conquest, empire management, and the struggle for ultimate military control at the heart of one of history’s greatest conflicts. It’s based on what the historians say happened in Three Kingdoms China, but with the trademark Total War sandbox systems enabling you to guide and rewrite events. Romance Mode is where things get a little different for the series – but not wildly so. If you’re unfamiliar with Romance of the Three Kingdoms, it’s a cornerstone of Asian culture and widely viewed as one of China’s four great classic novels. It still depicts the actual events, conflicts and political narrative of the period, but with embellishments and embroideries dialling the epic up to 11, as characters perform legendary deeds in both the stateroom and the midst of battle. And yes, you should totally read it. While Romance Mode is based on this romanticised vision of history, there’s a lot of fine detail that the novel doesn’t cover. 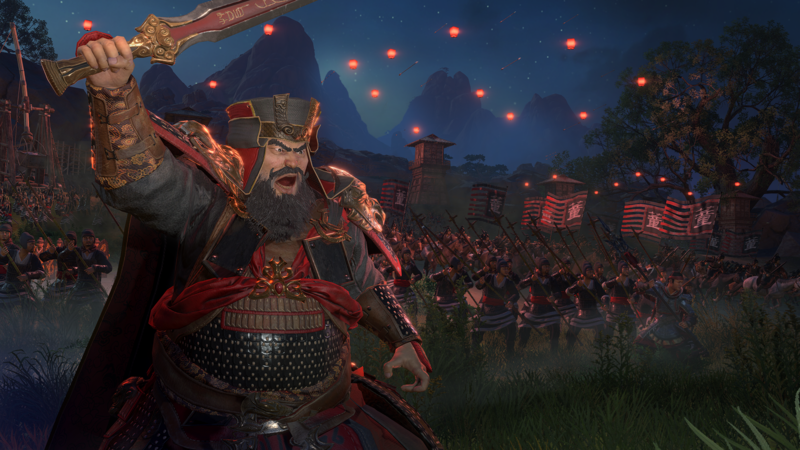 For example, the novel doesn’t delve into the architecture of the period, the minutiae of Chinese culture at that time, or the specifics of how armies are organised and formed, which are all key aspects in establishing a feeling of authenticity for the next deep and rich Total War sandbox. In such instances we’ve made design choices based on what the more formal histories say, along with advice from our historical consultant, Rafe De Crespigny. So in many areas of gameplay, Romance Mode is actually a more historically grounded experience than you might expect. Character theatrics aside, our interpretations of the nuts and bolts of ancient Chinese conquest are very similar in both modes. The real difference between the two is the level of emphasis each places on certain features, while reducing the focus on others. In Classic Mode for example, battle outcomes are decided principally by how you control your army, with individual heroes appearing as regular mortals and having minimal physical impact. As a result, your heroes have a different level of importance in campaign. In Romance Mode, battle outcomes can be heavily influenced by heroes. This means they have greater value to your armies, and in turn they’ll play a more prominent role in your campaign. So Classic mode is all about tactics and statecraft, while Romance is more about personal bravado and individual martial prowess. It’s neat that they got Rafe De Crespigny to consult. I really enjoyed his preface to the three kingdoms and always point people to it (like earlier in this thread.) Unfortunately both links to his essay seems to be down though. The high point remains…Napoleon for me. Anyway, there are enough red flags that I will wait and see. Historical TW is where it is at. I won’t link my hours on Napolean, shogun, Rome 1 and 2 and esp Attila. I have some faith. That said… I may not be a day one. Let it percolate a bit. I would say this game is aa classic “wait and see”. Can’t trust Napoleon/empire tw hours, those things were bugged and tw2.exe would stay running after you quit the game. Romance is going to be the real mode, it’s in the name itself. Historical mode is going to be like multiplayer, bone thrown in to appease the masses. That last video is cool but need to see all the numbers because if it’s just minor tweaks to the existing engine that’s just not gonna be cool after the initial shine wears off. Also, how the scenarios start is very important because I really hate the puzzly-diplomatic map a lot of scenarios start with - for example, you start with a NAP against the guy you really really should kill first. edit: percolate means the caffeine in my coffee is percolating through my arteries allowing me to function. An update regarding the development and release of Total War: THREE KINGDOMS. Less than a month to release. Not a good sign. From what I’ve been reading the natives are indeed restless. Lots of talk about an AI that’s brain dead is what I’ve been seeing. My own concern is CA isn’t up to the task of properly integrating Paradox elements into their TW formula effectively. Least I’ve never seen them do it properly yet. So when all the vids they’ve released appeared to be doubling down on that element I thought to myself, I wonder how that’s going to turn out. I wonder how much they’ll lean into the Koei games for inspiration - and the expectation of fans. Koei at this point is Three Kingdoms and has been so for 25+ years, and to a large extent how people “perceive” the characters of Three Kingdoms is seen through that success/fail ability lens Koei has fashioned out of them. For example, all three major characters in the Three Kingdoms story - Cao Cao, Liu Bei and Sun Jian all start (apparently) as roaming armies. (Or at least the last two i’m sure, I think Cao Cao does as well though). Those sort of starts, in Total War games, lead to map anarchy. Will players be disappointed if Cao Cao never forms Wu or Liu Bei never forms Shu if they’re playing as Sun Jian / Sun Quan? Will one of the random map corner factions end up being the strongest? In Koei games population directly relates to income, but in Total War corner empires have a distinct stability advantage and every faction is given a big stack of starting money for free so that they can field at least one full stack; which leads to all sorts of randomized nonsense of how the AI that is the last to attack ends up the strongest. I’m guessing this will be the case, because they seem to be leaning into the “initial” phase of the Romance story in their narratives, defeating Dong Zhuo. Having Zhuge Liang (or Sima Yi, most of the time) was like having a Leeroy Jenkins card in your deck to play every turn. How will that translate in a Total War game? The difference between a 3 star general and a 10 star general is a pittance compared to the huge bonuses Koei games give their characters. Will the named characters just get blurred out as yet another slightly better than average hero character, like in Warhammer? And how will the fans respond? In other words, I feel like when they start having to balance the “Romance” game, they’re going to have to balance it to the expectations gamers will have having played Koei games for decades of ‘how things should be’. All I know is I used Liu Bei’s high charm score and save-scummed until I got all the 90s stat generals in RTK2. Well, if delaying a couple months avoids another Rome2-style release debacle, I’m happy to wait. This is based solely on anecdotal evidence, but I think Atilla’s sales suffered pretty dramatically from the sour taste Rome2 left for many of us at release. That’s a hot mess I could do without. Yeah the delay actually makes me more confident in the game. Creative Assembly announces Three Kingdoms Mobile Mode. Yeah they should stick out of trying to be funny. I miss old school website design like that. Ahhh the repeating background image. I know, that webpage design was really fun! Webring, page visit counter, and Netscape. We live in a lesser world now that page counters are gone.